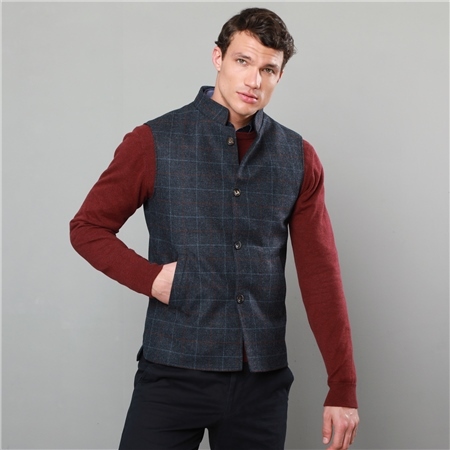 New this season, our Cavan tweed gilets featuring a smart Nehru collar, are the perfect transitional season garment. This lightweight wool fabric is designed and woven in our mill in Donegal, Ireland, featuring a navy base crossed with a subtle rust and pale blue check. Style with Burgundy Faugher Structure Cotton Crew Neck Classic Fit Jumper, Navy Drumore Geometric Print Classic Fit Shirt & Dark Navy Dungloe Washed Look Classic Fit Trousers.